Pet owners have unique concerns when it comes to carpet. Simply put, pets are hard on carpet! Their claws can snag carpet fibers. They tend to track in dirt and mud. And of course, the most dreaded issue of all, pet accidents can cause stains and odors to settle into carpets. With all those concerns you might think carpet is a bad choice. However, there are lots of great carpet options for homes with pets. Look for carpet with the highest stain resistance you can find. You'll still need to tackle the mess as soon as possible, but your carpet will be more forgiving of stains if you have one that is pre-treated. Many carpet manufacturers now offer a special stain resistance made with pets in mind. You can even purchase carpet designed to prevent pet stains from soaking into the fibers and through to your carpet padding - where smells, bacteria and mold can cause long-term issues from pet messes. Stay away from carpets made from wool. While wool makes soft, wonderful carpet fibers, they aren't very stain resistant. Nylon-based carpets are more durable, more stain resistant and more affordable - a great choice for busy households. STAINMASTER® PetProtect® carpet is ready, featuring built-in stain protection against even the most beastly pet stains. This pet-friendly carpet is color safe and fade resistant,so when accidents happen, you can clean them thoroughly without worry. SmartStrand Forever Clean carpet now features All Pet Protection and Warranty, the only pet-friendly carpet protection system that covers all pets, all accidents, all the time. Now SmartStrand is an even smarter choice for pets and pet owners. Keep your pets in mind when you look at types of carpets too. Longer styles of carpet threads can snag on pet claws. Loosely looped carpets can also cause problems. 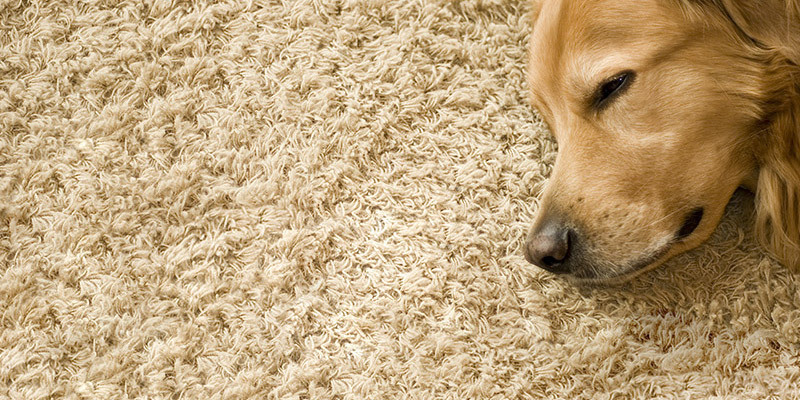 Some carpets come designed with fibers that easily release pet hair, making clean-up a breeze. Consider your carpet style options and discuss them with your sales consultant when you shop for carpet. Can you have carpet in a home with pets? Yes you can! Carpet is comfortable for both pets and people and a cost-effective way to add flooring to your home. Take a few precautions when purchasing your carpet and that carpet will last for years to come.